What Kind of Auto Repairs Can I Do Myself? | Freeway Auto Body Ltd.
Having your own vehicle is all fun and games until you need a repair done or it’s time for some routine maintenance – no one likes taking their car to the shop and paying a few dollars for parts and a few hundred for labour, am I right? Lucky for you, we are here to tell you that you don’t have to do that! …At least not all of the time. 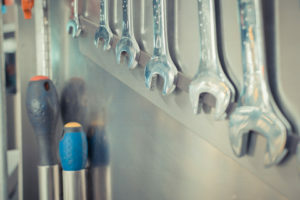 Whether you are a car buff who loves spending your free time working in the garage or you are the least mechanically inclined person on the planet, there are some repairs that you, with a little help from your friend the Internet, can handle yourself. Taking care of minor repairs and/or routine maintenance needs on your vehicle yourself not only saves you quite a few dollars, but also provides you with a set of skills that may come in useful down the road (quite literally). If you end up broken down on the side of the road, would you not prefer to be able to fix the problem yourself, rather than having to rely on a stranger passing who is willing to help or having to wait around for a tow service? Thought so. So What Repairs Can I Do Myself? Some of the easiest DIY car repairs are oil changes, air filter replacements, and battery upgrades. Changing your vehicles oil is as simple as getting under your safely jacked up car, pulling the drain plug, watching the old oil drain into the oil pan you strategically placed below, and then refilling the oil, from the top, to the appropriate level. If need be, it’s also super easy to change the oil filter while your at it. All it takes is the right sized wrench and a new filter. As long as you can correctly locate the filters location under the hood of your car, you can replace it. Just make sure you purchase the proper type of filters to use as replacements and don’t forget to close the metal clips when you’re done. The only things you need to remember when replacing your vehicles battery are disconnect the negative cables first when taking the old battery out, and reconnect the positive cables first when putting the new battery back in. These all sound so simple don’t they? It’s because they are. These are probably the simplest, and thus the most common, amongst the world of mechanical DIY. If you’ve given these a go and are confident that you could handle something slightly more advanced, why not try changing your headlights, replacing your spark plugs, replacing your brake pads, or performing a radiator flush. research, focus, and maybe meditate a little beforehand (we all know how relaxing mechanical work is). If you are about to undertake your first DIY session for any of these tasks, please do your research and ensure that you understand and are confident performing the steps required, and, if need be – contact us at Freeway Auto Body for help!